This has been looking at me for a while now, I got it in for work after seeing it in WHSmith’s in the station and desperately wanting it. 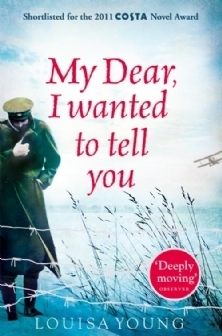 After my mega Pat Barker-although a couple of weeks ago, I thought the thing I REALLY needed to do was spend my holidays reading another book set during the First World War. Opening in the early 1900s, this is the story of childhood friends Riley, a working class boy, and Nadine, a middle class girl, who grow up together through Riley being ‘helped’ by Nadine’s family friend, an artist, and eventually fall in love. When war breaks out in 1914, Riley isn’t much interested in the lines of boys queueing up to get out of slum poverty and enlist. However an unfortunate incident with one of his benefactor’s artist friends makes him run away from his family and Nadine and join up. He is an excellent soldier, and natural leader, and is soon promoted through the ranks. The book takes about 80 pages to get anything more that holiday-read interesting, but when it does it really packs a punch. Riley’s quick progression from boring boy to fascinating, multi-layered man and his relationship with Nadine soon stop being Mills and Boon boring, and it is a real shame that the slow opening could put so many people off reading this excellent, gripping, sad and beautifully written book. The characters are mostly middle to upper class, so this fits in with the current Downton Trend, and Young also makes a striking comparison of the growth of facial reconstruction surgery during the war and the rise of plastic surgery beauty treatments for women. One of the most interesting characters, officer’s wife Julia, shows how limiting life was for women before the First World War, and how hard it must be to psychologically adapt to shifting sociological change. All in all, I enjoyed this book just as much as I did Regeneration-although it isn’t as ‘literary’. One thing though, I am going to start a ‘Modern Books About The War’ bingo cards as so many tropes were struck. 4/5, would make a cracking holiday read for romance and historical fiction fans, though my advice is to stick with it!